This is the spot we’ll be meeting at for the Westminster Breastfeeding Picnic this year. Monday July 20th, Victoria Towers Gardens. That’s the Palace of Westminster (Houses of Parliament) in the background, and Emily Pulling, and her weeks old daughter, is standing in front of the Rodin Statue in the top half of the long triangle that is the park. We’ll be having the Picnic on the lovely green grass you can see behind her. I mention the green grass, and grassroots, for a very specific reason. You can’t have a picnic without green growing grass. You especially can’t have a Picnic in the heart of London, without green growing grass. Why? Because our picnics have babies and young kids and Mums and Dads. And you can’t take young kids and babies into Summer heat, without green, growing, grass. This is why we had such a hard job finding a replacement for Parliament Square. If we’d not had access to this lovely stretch of grass, we’d have had to cancel. Even ‘tho the Sri Lankans have left Parliament Square, the grass wouldn’t have had time to recover. Living things, especially small and very vulnerable baby living things, need nurture. And our babies and toddlers and young wild and free kids, needed grass, and trees, in order for our picnic to be nurturing to them. Hot concrete, or pavement, or tarmac wouldn’t do. So the grass is very important. It’s also very symbolic. Not as it’s green (although breastfeeding is a very green activity) but because it’s small and grows slowly and quietly in the background. Grass is everywhere… it is the most successful plant on the planet. It’s also small and tiny and little and not very complicated. That’s why we refer to small, local and simple political active as ‘grassroots’. It’s the most basic form of activism, or organisation for change. And the Breastfeeding Picnics illustrate such grassroots activity, perfectly. We’re not a big organisation, we’re just Mums with computers in the kitchen. (Well, I moved mine to the living room as I spent too much time on it.) Emily decided one morning to do the first one, to make a stand. She was told no one would come. She was also told not to do it, as bigger and better organisitions were planning Great Things, and she should wait. Emily didn’t wait, she did what she wanted, low key and local, and in a couple of weeks and on Mumsnet, arranged something where 70 plus Mums & Tots, turned up and breastfed on Parliament Square. The next year was just as low key and spontaneous, a comment on a mail list, and there was another picnic – a spur of the moment. Regional ones were added in discussion – just Mums on computers – as the need to ‘be there’ even if they couldn’t travel to London, was expressed. Last year, between all the picnics, the best part 400 Mums and their kids breastfed at a picnic. We also have ‘new’ things this year. Birmingham Picnic really got inspired for this their second year, and they have had a wonderful ‘Breastfeeding Photo Shoot’ Day, where Mums and babies, and a professional photographer (a Mum!) went about Birmingham City Centre and just had fun. Shopping, lunch, coffee, ice-creams. And the photos reflect that Mums are in public spaces, with breastfeeding babies and… so what? Not a comment made once, whilst they went about the business of being a women being in public spaces who happened to have babies to feed with them. And that’s one of the functions of the breastfeeding picnics – when women are together, and are breastfeeding in public spaces… no one says a thing. Comments are usually only said to individual mothers, isolated from support. Present the world with a few Mums breastfeeding normally, and its no big deal. In the same way that a woman who appeared in the streets displaying her ankles could be pilloried… when she appeared in the company of other women with ankles on display… she was safe. Eventually, no one found ankles risque. In this ways, the picnics serve to make breastfeeding in public spaces more normal and everyday. People who walk past, unawares, may get a little shock of “Oh my” if it’s a new sight to them, but collectively, mothers enjoying a picnic as they feed their young, is not something that most people object to. Just doing it in the company of others normalises it. It also can be very empowering for the mothers concerned. Feeling perfectly normal and every day, and relaxing to the point where you forget to notice that what you are doing is ‘shocking’, is extremely liberating. A sense of safety rather than unease. A sense of safety mothers report feeling when in Scotland, even on their own. It’s rather shocking, isn’t it, that what we’re talking about is women feeling unsafe in public spaces… well, safe in public spaces in Scotland, and unsafe in public safes in England & Wales. Hungry babies and kids who can be fed without fear in Scotland, but who can’t be fed without some inner panic and a bit of trepidation in England & Wales. Oh please, don’t be hungry now… just wait until I can find somewhere safe… Of course, we’re making that up, aren’t we? 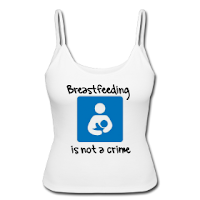 Another little grassroots shoot, again, from Birmingham, has been setting up t-shirts and tops with the slogan Colchester set up last year – breastfeeding is not a crime. Particularly useful as the London picnic can’t have posters or a table. But it can have clothing and badges. Must get the badge machine out and get cracking, actually. We’re hoping to have a Protect My Baby, Protect Me for everyone for London. Oh my blistered hands! We also have this fabulous professionally produced poster, available for all the sites, made by a Mum who does this for a living. Birmingham really have pushed the boat out this year. All on their own, just getting on with what seems obvious to them. No budget, no committees, just simple actions taken spontaneously: grassroots. Join them, print off a poster for your area’s picnic and pin it up somewhere, hand it on. Just be a Mum. Change the world. We’ve also developed interest from others. Newspapers sometimes email for quotes or info – but they never print them! An academic researcher has been in touch about how they developed, and why we do what we do. Kate Boyer is a lecturer in Social and Feminist Geography at the University of Southampton (and mum of a bouncing 15 month old boy). She is currently doing a research project on experiences of breastfeeding in public in the UK, and efforts to make breastfeeding in public easier and more commonplace. She has previously published work on women’s experiences trying to combine breastpumping with wage-work, and also on breastmilk donation. So, there we go. A little activity, that’s slowing turning into a bigger activity. Little tendrils reaching out and meeting up with other little tendrils, and huge big things happening as a result. Who knows, if we keep this us, Government Minsters might bother to read their mail? I, for one, am going to be very interested to see where Breastfeeding Picnics are in ten years time. Emily and I will see you in Westminster, next Monday. If you want to run your own regional picnic for next year, get in touch. If you’re going to a Regional Picnic, check the updates, and have fun. And when you’re having that fun, look down at the grass. It’s powerful stuff.